Spread the Words has taken on THE challenge that has daunted many adults - finding a cost-effective way to deliver digital textbooks to third world classrooms that lack computers and, often, reliable electricity. Solving this digital challenge will get much-needed teaching materials to those classrooms quickly, avoiding the substantial cost associated with collecting and shipping traditional, often heavy, textbooks overseas. Thanks to World of Children, Spread the Words now has the resources to put this project in motion. In consultation with open source digital content providers, Silicon Valley tech industry experts and elementary school teachers, Tatiana has developed a small, easy to use, solar or battery powered electronic device pre-loaded with early literacy textbooks, instruction videos, and early readers that will help teachers instill a love for reading in their school communities. 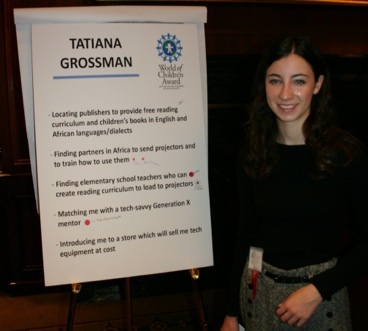 Botswana Ministry of Education is the first to test the prototype Tatiana and her team developed.